Follow the SOTA (Summits On The Air) adventures of Tony VK3CAT with company of XYL Nan and others. Yaesu FT470 (now VX-7R) hand held. 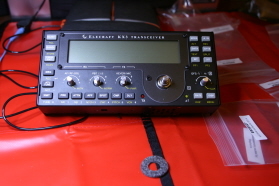 Able to be used with 2 metre 5/8th ground plane antenna and 30 watt all mode PA.
Elecraft KX3 fully optioned. 20 metre double extended zepp doublet antenna and also an Alex loop. 7 metre squid pole, camera tripod. Black Wolf 40 litre day pack with water bladder. Garmin MAP 62S & compass. Spot 3 tracker. Tony, your 2m yagi project is a good read. Most lightweight 2m yagi projects are based on 3 elements, you have found a way to incorporate a second director while keeping the overall weight down. Well done. Tony, saw your old posting about your HL-35V amplifier. Just bought one at the local hamfest. Would you please email me a copy of the user manual? Thx in advance!